I have been wearing the Alpinestars Supertech M10 helmet for a few months, but I also wanted to try the M8 because it’s set at a lower price point ($499.95 versus the M10 at $649.95). I recently received the M8 and wanted to compare the two out on the track, so here is some information you can digest easily after I rode in both. What’s the difference between the M8 and M10? The M8 is a multi shell construction utilizing a highly advanced molding technology with a multi-composite combination (not a full carbon shell like the M10), the M8 is 40 grams heavier than the M10 (at 1300 grams versus 1260 grams), the M8 doesn't come with an extra visor or a racing helmet bag, and that sums it up. Not much different on paper, but what about on the track? The M8 A uni-directional carbon composite with aramid layer that gives significant radial strength around the shell, preventing compression but allowing controlled deflection for reducing transmitted impact energy, and providing critical penetration protection. Alpinestars has developed a unique visor release system which, while ensuring the mounting is held securely in place for riding over the most extreme terrain and any track conditions, provides exactly the right level of resistance to ensure the visor detaches from the helmet shell if it is subjected to a significant impact – no matter what the angle. The base of the S-M8 has been sculpted to give a relief section, where the bottom profile is raised to clear the collarbone (Clavicle). Also, incorporated into the area of the base pad, where it sits over the rider’s collarbone, is an energy absorption pad; a more flexible compound rubber section which allows deflection when it contacts the Clavicle. The first thing you immediately notice about the M8 is its lightweight feel (just like the M10). The added 40 grams is barely noticeable when riding and to me still feels like one of the lightest (if not the lightest) helmet on the market. It’s surprisingly light when you pick it up and you just about forget you’re wearing it once out on the track, which translated into less neck fatigue. Weight isn’t usually a big factor for me, but after riding with the Alpinestars M10 for a while now I surely can appreciate the feeling on longer motos and the M8 is no exception. The cool-max interior liner is really nice too, especially in the desert when doing longer motos. Sometimes helmet liners can become slightly abrasive/course feeling once all the moisture dries up, but the M8 still leaves you with a soft feel inside and will not feel like a Brillo pad when putting it on or taking it off your head. Ventilation was an important focal point in Alpinestars R&D process of the M10 and M8. 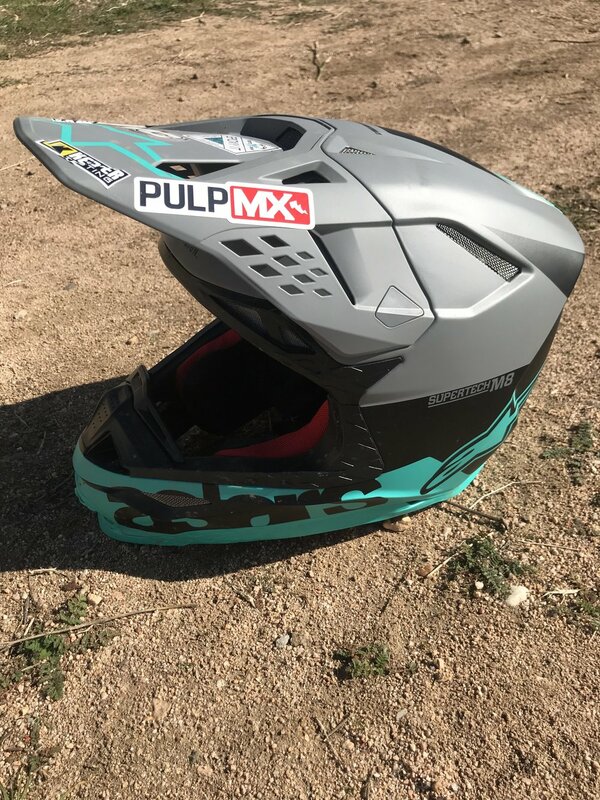 Immediately when I went out on the track I noticed this helmet flows a lot of air, noticeably more than other off-road helmets I have tested lately. Alpinestars heat mapping tests have resulted in specifically designed ducting which produces a positive flow into the helmet over and around the rider’s head, leading to improved comfort while riding and reduced onset of heat stress in extreme conditions.The visor design of the M8 is also a very innovative part of the ventilation system, as it’s profiled to direct airflow and acts as a channel to concentrate and smooth the flow into the shell. The Supertech M8 interior liner design is formed to optimize airflow channeling around the rider’s head before exiting through rear exhaust vents. The visor design also features a patented mounting/release system that sits flush with the helmet’s shell. There are no screws keeping it in place. This makes the helmet look even more custom and seamless. The visor snaps in and stays put until the right level of resistance causes it to release and detach from the helmet to mitigate any rotational forces that would otherwise be transmitted to the rider’s head, brain or neck in the event of a crash. You will not lose this M8 visor from a simple tip over/face plant like a Fox V3 helmet can do at times. I have tested this on a couple of occasions on my local sand tracks near the house. As far as the safety aspects of the M8, the carbon composite shell took a couple sizable hits over the few weeks that I tested it. Usually I am not much of a crasher, but I have been trying to push my limits riding with faster guys and have found myself on the ground a few times. The M8 left the track with scratches, but my head was no worse for the wear. MIPS and similar technologies are becoming more common these days in helmet construction. MIPS is a system that uses a low-friction slip layer between the comfort padding liner and the EPS layer, which allows one to move slightly independently of the other to dampen, redirect and reduce forces to the brain and neck, helping to reduce the chances of a concussion. Now is this the best technology there is out there for us moto guys and gals? I DON’T KNOW! I can’t sit here and tell you that this technology is the best and this is the helmet to buy over all the rest, but I can tell you the technology seems to work. This MIPS system will not prevent a concussion. There are many types of “helmet technologies” in the our world, so study up and decide on which one you believe in the most. Again, just like neck brace technology, it’s up to you to take in the scientific information and decide for yourself which one you trust in the most. I do like the A-Head fitting height and adjustment system as well as hydration system compatibility. The A-Head system allows the helmet to be tuned exactly to my preference for the height and angle at which the helmet sits on my head. With a micro-adjustable pad that is connected to the helmet’s inner shell, it is possible to raise or lower the helmet fit and also, to tilt the helmet forward, or backwards. It’s easy to use and adjust, but I did find that I needed to use thicker cheek pads to fill in the area inside the helmet. I am a size medium and the standard cheek pads are a little too thin for my skinny cheek bones (just like the M10). Going to 40-45mm cheek pads gave me a snugger fit and helped with the feeling of too much side to side slop. For you off-roaders out there, the hydration pack compatibility is also a very cool feature and my off-road tester Michael Allen found it beneficial on his longer trail rides. There’s a channel on either side of the chinbar behind the cheek pads to run a tube for a Camelbak or similar type of hydration system. It’s cool that Alpinestars includes some “off-road” into their lids! Each Alpinestars Supertech M8 helmet size comes with its own dedicated proprietary carbon shell size and EPS liner construction. This not only ensures that riders have a correct fit, but most importantly improves protection and the effectiveness of the helmet in case of an impact while optimizing weight reduction across the size range. The Alpinestars Supertech M8 is both DOT and ECE certified, comes in six different sizes from XS to XXL and will set you back $499.95. That is slightly less than most premium helmets that are floating around in the market today. The looks of the helmet is something that has grown on me the past couple months. I wasn’t completely sold on the front piece of the helmet where the A-Stars logo is placed, but after riding with it and seeing photos of myself with the M8 on, it looks attractive enough for me not to complain. And you all know that I am a picky SOB when i comes to gear/helmets. If someone made me choose between the M8 and M10. Think I would go with the M8 because it is slightly less money and comes in some colors that I prefer more. Check the SuperTech M8 and M10 helmets out over at alpinestars.com.